The generators on the Curve of Time came on early this morning - 5:30 am. Jan wanted to get us into the inside passage while the ocean was calm and thankfully we didn't have to get up to make it happen! I slept though the first few hours of the trip but rose to see a large boat passing us - the Alaska State ferry motor vehicle Matanuska. Our goal for today was Namu - a small town on the BC coast. 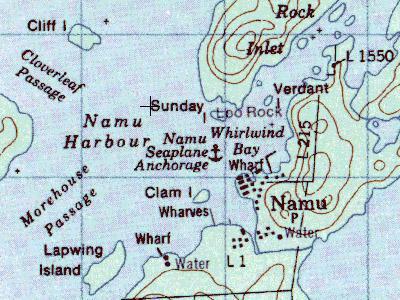 The Namu town site was stated with a salmon cannery in 1893 and developed into an important community. Located mid way between the north end of Vancouver Island and Bella Coola on the mid coast, it was a central location to supply fish boats, process fish and shipping out cans and fish oil to market. Namu really is dwarfed by it's environment. Namu is perched on the ocean's edge with forested hills behind it and small islands obscuring it. As Jan brought the boat in we could see the community and start to see how large the community once used to be - perhaps 600 people at it's peak. The BC Archives have a neat shot of the Fish Cannery in Namu from an "Aeroplane". The 1:50,000 view on the topography maps also gives you an idea of how things fit together. But what most people will know the name Namu from is the whale that was captured close to the town and eventually displayed in Seattle. The National Geographic wrote up an article on the story in the March 1966 issue (page 418-446). 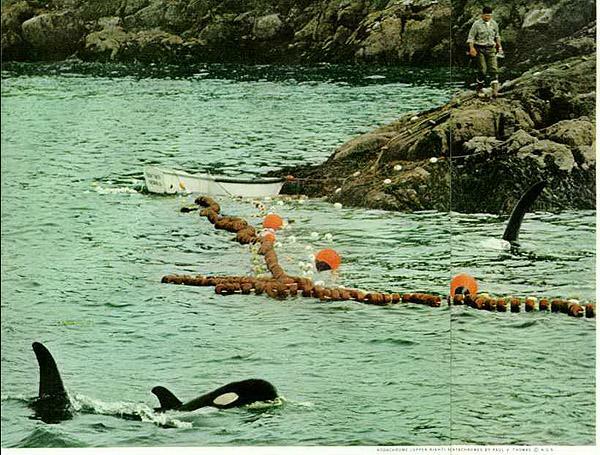 In June 1965, William Lechkobit and Robert McGarvey caught the whale in a floating salmon net that drifted close to shore. He was sold for $8000 dollars to the Seattle Public Aquarium but it ultimatly cost $60,000 dollars to get the whale the 450 miles to Seattle. 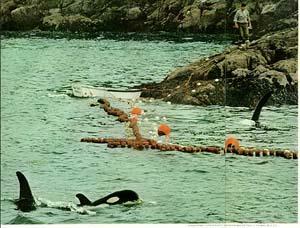 Namu was the first orca to survived in captivity for long enough for a signifigant public show. The first thing you notice about Namu is the decay. The fish processing facilities were closed in the 1990's and the town itself now has 6 full time residents and many visitors. The buildings on the pilings are showing decay - some have collapsed, others have plants growing out of them. But Namu is still very much alive. After getting over the decay of the fish processing plants, you start to look for signs of active life. The most obvious sign is the sport fishing industry. While we were there, there were three small fishing boats in the harbour and a few Halibut were being cleaned. While Namu no longer sells food, you can buy gas and drop of your recyclables. Tammy, one of the caretakers met us when we landed and offered to give us a tour of the standing buildings. Our first stop was the general administration build. The building used to be the bank, the post office, the hair dressing studio and had telephones. Now the administration holds a ping pong table, a large safe and a recreation room. Walking towards the general store, we passed the Namu Fire Department. At first it seems a little funny, but Namu was almost wiped out by a fire in January 1962 that destroyed large parts of the fish processing facilities. The buildings were rebuilt, but a fire could still do a lot of damage. These fire fighting tools look old but for the modes of transport available, I'm sure they are well adapted. The Namu general store would have been the center of activity when this community was running. Approximately half of the building (which is as large as any grocery store you find on the Gulf Islands) was dedicated to boat parts and equipment. The other half sold groceries and caned goods for days or weeks at sea. There is even a magazine rack with out of date magazines on it. Almost all the equipment necessary to run a store is present - there just aren't any customers. Leaving the main plant area you come to a hotel. There used to be a board walk around the harbour but the pilings are giving way so a path around the back has been cut. The hotel is in bad shape - a leaking roof and broken windows are letting water in and plants are aggressively trying to take over the lot. We walked through some of the building but I'm not sure how much longer it will be standing. Further along you can see buildings that would have been the recreation facility (with an indoor basketball court apparently) and a school but the wildlife makes access difficult. We came back to the ship for dinner but I left for one last walk around the town. Seeing the buildings at night with the lights on, it seems like everyone has just gone on vacation - perhaps they will be back soon! My grandmother and aunts worked at the cannery way back when. My mother died a number of years ago and I'm still going through all the photos..which included my grandmothers. Came across a number of Namu, the workers, buildings and I believe I saw one of a fire. I worked in Port McNeil back in the 60s..lived over on Sointula..never made it to Namu though. What a beautiful place. My Dad and I used to stop over on our way up to SE Alaska on our commercial boat, sometimes my uncle on his boat too. We always had a wounderful time there. My wife and I revisited this beautiful place in 2004 on our yacht, "RumRunner" it was still beautiful, but I had memories of a much better time when the town was up and running with all of the wounderful folks that lived and worked there. I just wish we could go back in time and every thing would be as it was, Namu and Butedale were the highlights of our trip North and coming South. now, they are only a memory, but a wounderful one to be sure. Nice pictures, thank you for sharing them. Hope you had a wounderful time while you were there. HI, my name is Lori and I am a great granddaughter of Robert Draney. I recently found some interesting pictures and info about my great grandfather in the B.C. Archives and was wondering if you know how to get any other information or pictures. I would also like any suggestions for the easiest and cheapest way to get there from Vancouver and what about places to stay. Should I bring my camping gear? I would love to come for a visit and see Namu. Namu isn't so easy to reach. There are no roads there and no regular boat service. I would first get to Shearwater/Bella Bella. You can do that by plane (Pacific Coastal flys), or by BC Ferries. Once you get to Shearwater you need to find a boat to drive you the next 30 km to Namu. The resort (http://www.shearwater.ca/services/index.htm) would probably be able to set you up. I'm not sure if Namu takes visitors anymore. Wow you;re pictures are amazing! Namu is so beautiful isn't it! My grandfather Peter Darwin is the care taker of Namu with his wife Reene . I hope to be back soon did you guys have a chance to make it up to the lake? When I was last in Namu with my father circa 1990 most of the buildings were closed the store and showerhouses were still open however. We spent one afternoon taking a fantastic trail up to Namu Lake. It really is a beautiful walk but Im not sure how accesible it is after seeing the severe deterioration of the boardwalk. A fond memory I have about the place is wondering if the boardwalk would give out from under me as even at that time it was starting to show serious signs of decay. Wild Nature up there though. Alot of my wife's family and some of my cousins worked in the Namu cannery in the 50's. Myself I grew up in Butedale where alot of my people were born and grew up in also. It's good to see these photos. Brings back alot of fond memories. My family moved to Namu in 1947 and were there until 1962. It was a wonderful place to grow up. I lived in Namu from 1959 to 1968. My mother Dorothy Potter was the local teacher and she ran a two room school house. My father was a bookkeeper with BC Packers and also ran the post office from time to time. I remember the devastating fire of 1962 when all of the town people were evacuated to the "oil dock" which was a great distance away from the fire. Growing up in Namu or any of the small coastal towns was quite an experience. You learned to fish and hunt at a very young age and some of my fondest memories are from those days. One of friends from those days was a fellow by the name of Erik Eriksen and i believe he had a sister whose name was Ida. I"m wondering if Svend-Erik Eriksen is any relationship. I was lucky enough to have family who lived in Namu. My problem is I can not locate them since I left in 1958. My grandfather Matt Brown was a big time fisherman I am looking for any information on him and his family like my dad Robert Brown. If anyone can tell me anything I would really appreciate the help. Thanks for the great pictures. My family moved to Namu in 1949 and I have a picture of all the students in front of the school. Mrs. Kangus was the teacher and in my picture are Danny Campbell, Noreen Sahonavitch, Ralph Benson and my brother George and sister Sharon. Our Dad, George Hicks worked in the store. There are lots of other students in my picture, We lived on the oil dock, then moved to some new houses up near the school. I was about 11 years old and set pins in the bowling alley. Moved to Kildonan, on Vancouver Island in about 1952. Saw your comment Danny Campbell and just had to make a comment. Those old picture of Namu, sure brings back a lot of memories (good and bad alike). But still more good than bad. I work in the cannery from 1963 to 1968 great times. Erik its good to see your name in print. Would to talk if its possible. Memories; they keep flooding back. I remember Danny Campbell and his brother Murray when they fished on the Seiner Vampy or was it the Vampy II or maybe both. They used to call in at Bella Bella and visit the Bainbridge family. Bill Garrack (spelling) was a manager at Namu for some time and his son Jimmy got my train set when I left for school in Vancouver. Art Meadows worked at the store in Bella Bella for years and then moved to Namu to manage the store there before moving back to Bella Bella to finish out his many years with BC Packers. Seine Boats would wait to get to either place when Art was there. He was the best butcher on the coast. In his later years my Uncle, Tom Williams was a winter caretaker at Namu before it began to close down. Margaret Hicks said she moved to Kildonan in 52. Our family moved from Hecate to Kildonan in 48 and then to Bella Bella in 50. My brother and I were back in Keldonan sport fishing some 50 years later with David Potter and my facebook page is me standing in front of all that says that Kildonan was ever there; a floating post office. I enjoyed Erik's pictures on his facebook page very much. When I was 15 to 18 years old I trolled out of Spider Island camp for three years, first in my 29ft. troller the Alton 1 and the next couple of years in my 34ft. troller the Estrellita. My brother Bill Bamford and his wife Tim ran the BC Packers fish camp WS9, which was moored in Spitfire Channel during summer. Bill and Tim's two girls Carol and Shirley played on the roof of WS9. Bill had built a fence all around the roof. I borrowed Nick Sohonovitch's Troller, the 40ft Beau for a couple of trips, fishing the Goose Island banks. Brother Bill and family lived in Namu after the salmon season each winter. Bill ran the bowling alley and did other work around the cannery doing cannery maintenance. I spent one winter on Namu Lake trapping and hunting. The other two years, spring and fall I came from and went back to Vancouver in Estrellita to work on Tugs. My friend Les Beasley worked at Namu in the cannery in the 1950's. I spent a summer doing research on salmon physiology on the Atnarko River 1969. I'd like to find Les--anyone know him? Hello! My best friend and father figure until the end was Fred Welland. We took many trips to Namu (where he worked for several yrs prior to our friendship) and then we would carry on to the Nass Valley, via the Inside Passage and road trips. In New Aiyansh we lived and worked together as he, an amazing writer and me a photojournalist. I am taking a voyage to retrace Fred's life and visit with people who knew him. If you can help, please let me know! I'm looking for his friend Cove? Would anyone know who this is? Thank you for posting the photos and writing the comments. I lived year round in Namu for 10 years - 1979 to 1989 - with my wife Nairn. We had our first child, Sarah, in Namu during the first 9 months of her life. I have thousands of photos and many fond memories. I welcome communication about Namu. Great pictures! Also, so nice to see all the familiar names. We lived in Namu from 1959 for many years. My Dad was Hank Kelder and worked in the machine shop. My mother Lucy had three more children after we moved to Namu. We started with 3 kids, myself (the oldest, brothers John & Michael. Then three more brothers: Murray, Randy & Jeff who were born in Namu. Bill Hardie jr. Monday, Nov.26, 2012 at 11.38 pm. Hi Bill, I also lived in that house next to the school from 1966 to 1969 when the cannery closed down. After a short walk to the lake (shoeing the wolf packs off the boardwalk) we'd canoe to Strawberry island for a picnic. I remember going up to the second and third lakes with your dad. He was a really "cool" guy. My Big Sister Marg Mentioned this site to me, and I very much enjoyed the old photos. It was a great place to grow up in my early years. I remember a lot of College & University chaps would come up during the fishing season to work in the cannery. They used to play the local natives basketball games. Those games were very interesting as they were more like WWF Wrestling than Basketball. My Father worked with Mr. Campbell in the Company Store. They had a contest one winter for a large Christmas stocking filled with games & toys. All you had to do was write a letter to Santa and if your name was drawn you would win the stocking. I will never forget my excitement when Mr. Campbell drew my letter out of the box and presented me the stocking. We later moved to Kildonan on Vancouver Island's Alberni Canal, another B.C. Packers fishing Community. Finally my Dad moved us back to the Mainland (Vancouver) when he was transferred to Steveston. Archaeologist there in 1970 with Dr. Jim Hester and a National Science Foundation research grant. I found my first death from a known cause - an arrowhead stucck between C1 and C2. The man was surrounded with shell beads as were a woman and child buried with him. Just wondering why there's no mention of my Grandfather Robert McGRvey who caught the whale Namu. Just figured he'd be mentioned at the very least for bringing this whale to scientists for studies. I was the 2nd cook in the mess hall for the summer season of '79. Great memories after seeing the photos. I especially remember the warmth and sense of community that was shared by all. Often walked the trail up to the lake for a swim between lunch and dinner service. I am the grandson of Oscar and Jennie Bainbridge. My mother is Gwen Clark (nee Bainbridge) My mother took me back home to Bella Bella for many a summer in the 60's and 70's and when I was of age, I worked on ice packers for the summer holidays. These pics bring back wonderful memories of traveling on the boats to Namu to drop off the catch, Shearwater, Ocean Falls and other smaller communities on the coast. I believe the Bainbridge's owned a small Island in the area where my Great Uncle was buried but I believe the family sold it for timber rights to Macmillan Blowdell back in the 80's. I haven't been to the area in over 40 years but I still remember what a great place to grow up, work and live it was for me.